March 2011 - Do Your Plants Talk Back? Over the years, numerous emails have asked about plant immunity to diseases and pests. Readers tend to think of plant immunity as similar to ourselves or our pets. Our immune system depends on a circulatory system (blood) flowing through our body and the production of specialized cells and compounds that attack and destroy attacking diseases and organisms. Plants do not have a circulating fluid like blood that could carry such disease fighting materials to the site of infection, but they do fight disease. As many emails have noted, plants survive infections and attacks by insects. How do they do it? Plants have disease fighting mechanisms, but they work in a different way. When a plant is infected by a bacteria or fungus chemicals secreted by the dying cell alert other cells in the plant to the danger, a Hypersensitive Response (HR). The next cell quickly dies and becomes a physical barrier to the invasion. In death, it may also become hard and unattractive to the invader by producing toxic compounds. Those who talk to their orchids may not be surprised to learn that plants “talk” communicate with each other too. When damaged by a disease or insect, plants can release a chemical signal that is transmitted through the air to other plants initiating the production of toxic compounds in leaves and flowers. 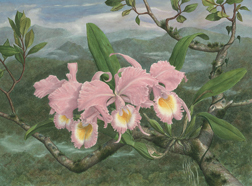 Many orchid hobbyists have noted the tendency for new plants brought into the greenhouse to be attacked by insects or disease for the first few months. Afterwards, they recover and do not have any additional problems. Now you know why. Research is underway to develop ways of stimulating the Hypersensitive Response in plants artificially. A naturally occurring protein isolated from bacteria has been shown to initiate the protective response in plants when applied to leaves. Best of all, it is not a pesticide, but a deterrent. Everyone I know is really hoping that the groundhog was right this year because it has been a cold winter. Many of the orchids in my greenhouse are telling me winter is over, too, by putting out nice new growths. Phalaenopsis in bloom should also be growing new roots and leaves if they are getting enough fertilizer. Cool nights and warm days are perfect for the growth of most tropical orchids. The low humidity, longer days, and more intense light this time of year, means more water is needed. This is perfect, because it allows feeding with dilute organic fertilizers, e.g. fish or seaweed emulsion. These products are great to start the growth cycle because they have all of the major and micronutrients. Also, be sure you water pots and orchids thoroughly; flushing salts from the roots and pots before hot temperatures arrive. If you use Nutricote (Dynamite) it can be added now, along with the dilute liquid fertilizer. The Nutricote lasts for 6 months, but most orchids prosper from a little spring tonic of fish emulsion. The Nutricote is also heat activated and does not seem to really kick in until late spring, depending on where you live. Vandas and other hanging orchids always perk up after they get a little fish emulsion, especially if they have been suffering over the long winter.